Compare the end with the beginning to determine Resolve. Where your Main Character starts in a story and where he ends up are crucial for an audience to understand the meaning of your story. It is the similarity or difference between the two that defines the Main Character’s growth. The rest of the story must support this growth. Even if you have a great bit of storytelling—if it confuses the Main Character’s growth, you’ve got to throw it out. Leaving it in would be a problem…as it was in the latest Bond film. Without thinking too much about it, I gave him that distinction and was even planning a post about how he was a Steadfast Main Character. I was going to show how he was broken down over time, until he got to the point where he wasn’t really sure which direction he was going to take. I told Chris Huntley, one of the originators of the Dramatica theory of story, of my plans. He disagreed and thought that Bond was a Changed character. I listened patiently to his argument, but still wasn’t convinced. That is, until I took the time to sit down to write about it, and really had to think about the story. Writing this blog, especially on a day-to-day basis, has shown to me the importance of thinking through my take on a story’s structure. Because the Dramatica storyform is so precise, one slight change in context can make all the difference. Only when I start writing it out, and put into permanent form my thoughts, do I finally begin to realize just what is really going on in a story. It happened in my analysis of Training Day, and it happened here in my analysis of the latest Bond film. Chris thought Bond was a Changed character while I thought he was Steadfast. Take the Main Character as he is at the end of your story and rewind. If they would still behave the same way, then you don’t have a Changed Main Character. 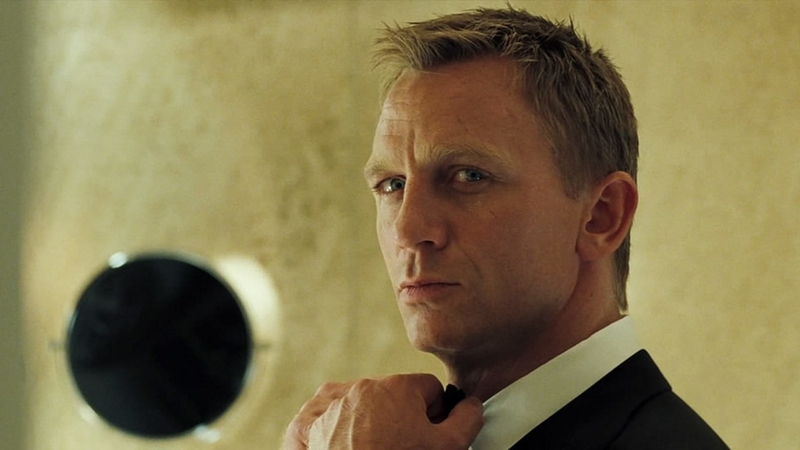 In Casino Royale, Bond discovers that the love of his life, Vesper Lynd, has been using him to get at the money. Betrayed, he springs into action, tracking her down amongst the streets of Venice. He lurks in the shadows, trading an instinct of revenge for the knowledge of who she is working with. Contrast this with the beginning of the film and his attempted acquisition of the bomb-maker, Mollaka. Faced with all those rifles pointed at him, Bond takes the easy way out by spinning Mollaka around, firing one shot into his chest, and the other into an easily explodable gas tank. Bond let his passions get the best of him, and in doing so, robbed M of valuable information. There were several opportunities for Bond to give into his passions once he learns of Vesper’s deception, but he’s not the same person he was at the beginning of the film. For Bond to be able to control his rage and jealousy, especially since it’s with someone he has grown so close to, is a big deal. He reserves his jealous rage long enough to be able to witness her meeting with Eyepatch Guy. Of course, once a knife is held to Vesper’s throat and her life is threatened, Bond states quietly to himself, “Allow me.” It is a more remorseful, cold and calculated response than he would’ve given at the beginning of the story. His passions no longer get the best of him. This last notion, that Bond has become cold and dispassionate, may seem incorrect, especially when you consider the very first sequence of Casino Royale. And here is where the coolness factor of the storytelling overruns the structure of the story. In black and white, we witness Bond’s first two kills. While the first seems to shake him up, the second is “much easier” for him to accomplish. In a cold and calculated way, he shoots the double agent. Unfortunately, as cool as that first black and white sequence is, it really breaks the integrity of the Backstory. Backstory, in a Changed Main Character, is supposed to show how the Main Character’s justifications were built up. For that scene of his second kill to work within the rest of the story, Bond’s passions should’ve been played upon. Instead of telling Bond how easy the second kill is, the double agent should have insulted Bond and prayed upon his ego. Forcing Bond to react passionately in this way would have continued the trend of justification that was started with the first kill. Another interesting hint that we’re witnessing a Main Character Change moment is the use of a musical theme. There is this very low sort of suspenseful cue that you hear at the end while he’s stalking Vesper. This same theme was heard only once before—while he’s sitting in the dark waiting for the double-agent to arrive. In hearing that cue again, I thought to myself, wait a second, we’re watching a different guy now. There is a change of point of view that has occurred. Bond has lost a fundamental part of his character. Again, this cue happened during the Backstory, so it could be thrown out and the story would still work. I just found it interesting. Whether or not they brought back that cue so that subtly we could interpret some kind of change is a matter of interpretation. Casino Royale presents us with a rare and unique take on Bond. In sharp contrast to other Bond films, this one gives us Bond as a Changed character. By no means do I think this film is an example of masterful storytelling. There is a huge story “hiccup” that occurs during an apparent false ending—a problem that could’ve been easily fixed by shifting story events around. No, the point of this article was to point out what separates this Bond from others. Instead of resolutely standing strong and forcing another character to change, it is Bond this time who is having the paradigm shift. I think it was key to this film’s feeling of “freshness” and to the overwhelming positive response from audiences everywhere.